I'll give that a Woo. I'll give it a Yay, and possibly a Houpla too. 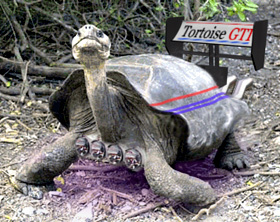 That's not a street legal tortoise! it's not in the street then, innit? Look at it. Those front legs clearly extend beyond the wheel leg arches. 0 to 7 in 3 hours! The winner is that tortoise, and the prize is a capital WOO! I saw a moped with under body lighting. Good thing it's got that spoiler to hug that baby to the road!